A dedicated workbook to support and consolidate grammar learning and translation skills for AQA GCSE Spanish for first teaching from 2016. 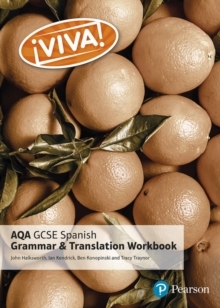 Includes:explanations of key grammar points, verb tables, and exercises to embed grammar knowledge translation exercises and strategies for translation both into Spanish and into English a bank of revision translations bringing together grammar and vocabulary learning from throughout the course clear links to the Viva! Student Books from the same series.